fuboTV is great for soccer fans, but it also offers popular channels and other sports programming—making it a solid choice overall. fuboTV is the best way to watch international soccer (fútbol) online we’ve seen. It does offer regular and popular entertainment channels as well (think HGTV and Food Network), but fuboTV specializes in sports programming on top of that. You can watch and record most live sports we can think of. You’ll get notable sports channels like beIN SPORTS, NBCSN, ESPN Deportes, FS1, FS2, and Fox Deportes. We’re glad to see three main packages offered with add-ons that let users customize their TV plan for a sports-centric experience. We recommend fuboTV primarily for fans of fútbol (or “futebol”) who want Digital Video Recording (DVR) service, since there are other services better tailored toward regular entertainment programming. You may want to look to SlingTV, DIRECTV NOW, PlayStation Vue, or other streaming services if sports aren’t your main focus. What types of sports programming does fuboTV cover? Not sure what leagues you’re interested in? Trying to decide if you want the Latino package only, or if you want to expand your channels with an add-on? No worries—you can try every combination of the packages below during your free 7-day trial to fuboTV. Recently, fuboTV changed the Premier package price to $19.99 for two months before reverting to the $34.99 price after. We don’t know if this promo will last, but it’s better to jump in and see if you like fuboTV now, before it reaches that higher price consistently. We’re not quite sure if fuboTV’s niche is going to be enough to make it stand out from Sling TV or DIRECTV NOW, but they are constantly updating their service to compete. The service added FOX in 49 new markets and updated the cloud DVR to record 30 hours of programming with unlimited storage time (it was “ten slots” previously, meaning you could only hold 10 recordings, and the recordings only lasted for 10 days before being deleted). If you’re after high channel counts (including “too many” music channels), you can get more bang for your buck from a cable provider But if you want these specific sports channels, fuboTV is the better option. Plus, fubo makes it easy to watch lesser-viewed events that don’t always get covered by bigger networks like ESPN. fuboTV sent out an email 8/3/2017: “Primeira Liga TV will no longer be available, but we’ve got you covered! fuboTV’s price of $34.99 is warranted given the focused sports programming, especially for lesser-viewed events that may not get covered by bigger networks. If Central and South American or Latin sports aren’t your thing, it’s better and cheaper to go with either Sling TV or DIRECTV NOW. If you’re trying to get all-things-TV in one service, you may spend less with a traditional provider like DISH or DIRECTV. We like the organization of fuboTV: programming is listed by date, and it shows how many events are contained in the date. Then it lists event type, whether the event has started, the teams playing or what tournament it’s part of, and what channel it’s being broadcast on. You can either tune into the channel or set up a DVR recording. The home screen highlights main events and provides a countdown to the live sports event in days/hours/minutes/seconds, which is pretty cool for those of us who want to grab some nachos and drinks real quick before the match starts. As for the fuboTV app’s quality, the picture’s great; it looks like live TV. With this app’s design, there really isn’t much difference between watching on your phone, tablet, or big-screen TV. You can watch live matches and your DVR recordings simultaneously. While fubo advertises two devices at the same time, we were able to get three simultaneous streams, but adding a fourth seems to be when the service noticed and kicked off the earliest opened tab. Good news is that means you could have a split screen set up and then a dedicated screen for the big match. Or the whole group can watch a big match while other users can watch on their mobile device. Or if you’re only slightly interested in a game, you can keep it open on a tablet while you catch a movie like Tron: Legacy. With some channels, a playback timeline (play/pause/rewind) is provided so you can catch up from the beginning or jump back to live. The lag—or the delay between clicking a spot on the timeline to when it actually starts playing—wasn’t noticeable (though our internet speeds at the time were around 80–85 Mbps). fuboTV’s streaming capabilities seemed to be on par with other services we’ve tried. 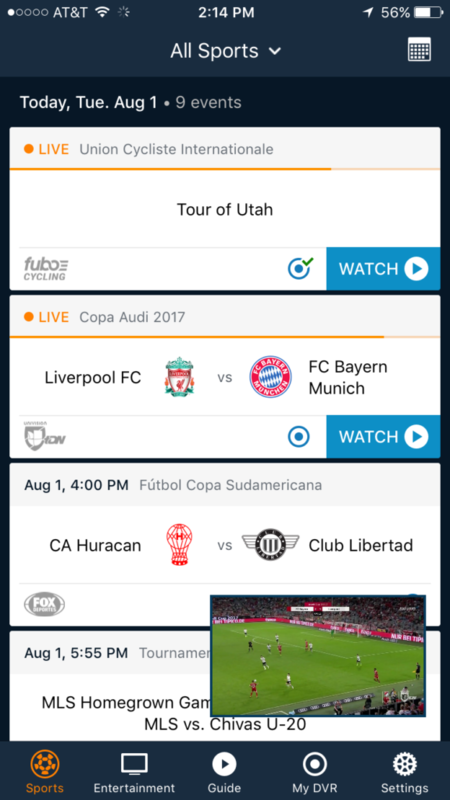 How do you use the fuboTV DVR? We like that DVR service is automatically free with fuboTV—unlike Sling TV, which costs $5 extra per month. With the fuboTV DVR, you automatically get 30 hours of programming and save it for an unlimited amount of time. Need more? You can add the Advanced DVR for an extra $10 per month, which expands your storage to 500 hours. In the “My DVR” menu, you’ll see the event listing with channel name and the date. fubo’s DVR is less of a record function and more of a request function. Anytime you have the DVR option available, simply click and it will automatically schedule the program. There’s no need to set times either; it’s programmed into fubo’s DNA to get the whole event (and often a little bit more for good measure). It seems pretty foolproof. Because fuboTV focuses on fútbol and other sports, we’ll focus our criticism around that, but we still weigh the non-sports benefits and costs. These month-to-month services all allow you a seven-day free trial, with the exception of PlayStation, which only offers five days. fuboTV is clearly the best in its area of focus: fútbol. Although other services may be cheaper initially, when you add on the channels and packages needed to watch the same events, your monthly bill may be more expensive. On top of that, some services like PlayStation Vue don’t even offer beIN sports, a major provider of Central and South American as well as Latin sports. If you begin watching a game on Sling TV that has already started or almost finished, you can rewind it back to the beginning of the match to see it in its entirety. You can’t do that on fuboTV until after the program has finished (at least most of the time—it seems to be network-based). So Sling wins points there. Sling TV’s biggest advantage over fuboTV is the availability of regional packages like CARIBE, ESPAÑA, MÉXICO, and SUDAMÉRICA. Those aren’t necessarily fútbol exclusives, but they might interest similar audiences. For basic fútbol and Spanish-speaking networks, you can get Sling Latino as a standalone package for $10 a month, which includes Univision channels, beIN Sports en Español, and TV Azteca. However if you want the same sort of service from Sling TV as from fubo, you won’t get FOX Sports or NBC channels unless you sign up for Sling’s Orange+Blue+Spanish TV packages, which would $45 per month—an extra $10 more than fubo at $35 per month. On top of that, you must add $5 for DVR service with Sling TV. Sling’s DVR service goes to 50 hours, which is roughly 24–25 games, compared to fubo’s free DVR service with 30 hours (or roughly 15 games) or $10 service with 500 hours. While we like Sling as a more full-fledged entertainment source, fubo is still better at providing sports coverage. Fubo is cheaper than DIRECTV NOW if you’re after sports, so it’s better for fútbol fans. DIRECTV NOW costs you $70 to get Univision Deportes. Unlike with fuboTV, Fox Soccer Plus, beIN SPORTS (English), beIN Sports en Espanol, or beIN SPORTS Connect aren’t available with DIRECTV NOW. Overall, it isn’t nearly as geared toward soccer fans, although it does have one of the better interfaces of the streaming services. The minimum package price for regional sports is $50, so you’ll likely pay less with fuboTV if you’re a sports fan. fuboTV beats PlayStation Vue for the fútbol crowd because Vue lacks beIN SPORTS English, beIN Sports en Espanol, beIN Sports Connect, Univision, Univision Deportes, or UniMas. That means it doesn’t provide access for La Liga, Capital One Cup, Serie A Championship (Italy), and more. Plus, FOX Soccer Plus costs an extra $14.99 extra per month for Vue. The mobile experience on PlayStation Vue is limited compared to its interface on PS3, PS4, and Roku devices. It’s a matter of streaming rights, which makes for inconsistent viewing experiences for users. fuboTV’s mobile experience is just about the same for mobile as it is Roku or Apple TV, so it wins for interface consistency as well. Fubo is also a lot easier to sign up for than PlayStation Vue, which can’t be done from a Roku or mobile device. fubo isn’t meant to be a full-fledged TV service, so although it’s moving in that direction, it’s still hard to compare. If your focus is on fútbol, go with fuboTV. If you need more entertainment than sports, stick with a major provider like DISH, DIRECTV, or Comcast. On one hand we like how minimal the interface is—no need for anything too fancy if you just want to watch live sports or set up a recording for that day or week. But it’s a little too minimal in some regards. For instance, we wish that when you click into a channel where it lists a full schedule for the rest of the day/night, you could schedule DVR recordings from that screen. We’d also prefer it included a “follow my team” sort of option. Combined with a lack of search functionality (totally wack! ), navigating fubo seems a little tedious compared to other services. Also, watching live TV doesn’t always give you a playback timeline; that means you won’t always be able to back up and replay a section without having a recorded version or without waiting ‘til the event is complete. Even when there is a playback timeline, hovering over the timeline doesn’t give you a preview thumbnail picture (like Netflix) to let you easily see when something like a goal or injury took place. These things considered, it’s a bit disappointing fubo focuses on live and recorded sports, but the interface doesn’t have a decent replay function built in. One thing that’s annoying about using the fuboTV app on a mobile device is how long the menu screens and pause/play button stay up after touching. If you’re holding your phone while on the train or bus, you may find yourself staring at that play-button circle a little too often. For people with trouble hearing, captions take up too much of the middle of the screen, making it hard to tell what’s going on in the match. The captioned commentary will be more of a distraction than a help, unfortunately. Another caption-oriented complaint: we’d love for fuboTV (or the broadcast networks themselves) to include Spanish, Portuguese, and English subtitles for a more inclusive experience; that’s a pretty big ask, but we’ll still throw it out into the universe. We like fubo for what it is: a streaming service centered around fútbol and other sports. For latinx fans of fútbol, this is the best service to go with if you want beIN sports, NBCSN, ESPN Deportes, FS1, FS2, and Fox Deportes. You get leagues featuring Real Madrid, Barcelona, and other teams’ full coverage. Trial subscriptions automatically convert to paid subscriptions. If you no longer want the service after the free seven days, you must cancel before the end of the current billing cycle to avoid being charged. fubo is an internet TV streaming service like Sling TV, DIRECTV NOW, or PlayStation Vue. The service caters to sports fans, especially latinx fútbol fans. You can stream local, minor, major, and world league teams. Either watch live or record it for delayed viewing. Great for use at home or on the go with streaming devices like Roku, iOS devices, or Android devices. How many devices can you use on fuboTV? Technically two devices, although we were able to get three streams in some cases. What channels do I get with fuboTV? Unfortunately for impulse buyers, fubo doesn’t list nor link to all the possible channels in the ordering screen. This means a few channels are highlighted, but you don’t know how much you actually get without consulting a channel lineup table for fuboTV. Which soccer leagues and competitions does fuboTV cover? How do I watch fuboTV on my big-screen TV? You can hook an HDMI cable to your laptop, use a streaming device such as the Roku, or download the app for either iOS or Android. Each of these has slight differences in user interfaces, but for the most part they’re all the same. We’re stoked to see that it’s included a decent amount of ways to watch fuboTV. Have more questions? Please let us know in the comments below! This is almost legitimate fraud. The service doesn’t really work for the big soccer matches which is why I signed up. The owner sent out an apology when the last USMNT match wouldn’t work at all because their servers crashed. They didn’t offer any compensation so I canceled. They have since charged me for two months since then and won’t stop it seems. Im now disputing this with my credit card company. Lies, bad customer service and a terrible product as well! I am four days into the 7 day trial period and my experiences have all been excellent. Picture quality is great; there is no buffering at all, and navigating is satisfactory. Being in a trial situation I did not try the DVR function but my son tells me it works ok. A few negatives, you can Pause and Resume while watching a match but you cannot backspace or forward. CNN, ESPN, ESPN2, CNN, ABC, TENNIS CHANNEL (and perhaps other services) are not available. Selecting a channel other than sports is cumbersome and there is no provision for favorite channels. Still, technically, FUBO works great so long as you have adequate bandwidth from your internet service provider. They charged me $17.90 during the trial period, DO NOT USE this grabage!! They neither have the bandwidth to operate their service for high demand events, nor the technical competence to have their service run with sufficiently infrequent bugs and playback issues at normal times. Customer service can ONLY be contacted by email and are typically slow to respond. Can’t watch anything tonight? You’ll hear back some time the next day. They will also open by trying to blame your internet speed or the device you are using. They do not take responsibility for their buggy software, and once forced to acknowledge the problem is on their side, they are rarely ever able to resolve issues. Whether they do or not, the same issues always come back later. They still have the same unresolved bugs they had a year ago. I wanted to like this service more because their offerings are great, but their technical team and customer service kill it. If only PlayStation Vue hadn’t dropped BeIN, I would have be spared all of this frustration.